Yesterday I visited the German-Chinese Economical Day 2013 in Cologne which was organised by the Deutsch-Chinesische Wirtschaftsvereinigung e.V. 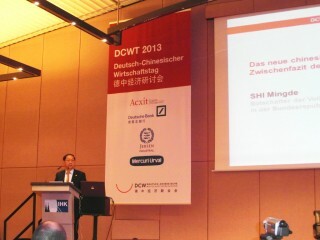 The opening was presented by the Chinese Ambassador in Germany Shi Mingde. He talked about the possible consequences which will follow the big reforms in China. Among other aspects he pointed out the importance of the economical development and the importance of the “market principle”. At the same time, and this I will keep in my mind, he pointed out …………..